Follow our Board Jack Plan and build your own portable board jack. The portable board jack is designed to hold work along the front edge of a workbench. The board jack works in conjunction with a face vise to hold long boards or panels for handplaning or other bench operations. 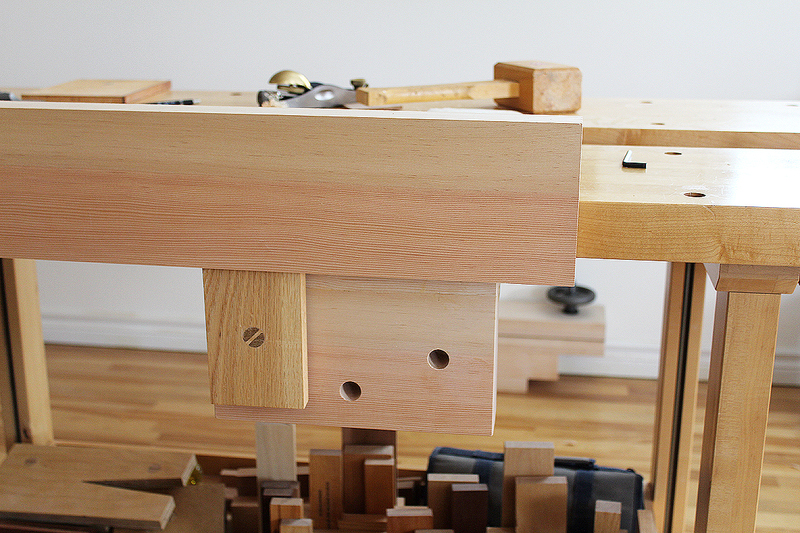 The board jack is both versatile, portable and self-aligns to the workbench top. It attaches to the underside of any workbench top with a slab top. It is easily adaptable to a workbench top with a thickness between 1 1/2 inches to 3 1/2 inches. The board jack is easily positioned along a workbench surface. The position depends on the length of board to be supported on edge. The board jack design originated from a need to clamp the opposite end of a board along its edge while handplaning. 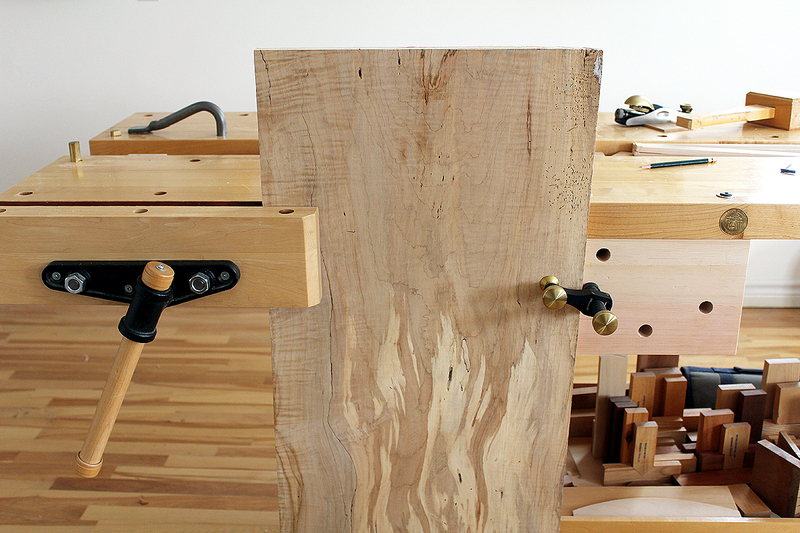 With a long board clamped in the face vise of a standard workbench, there is no support at the other end of the board. Unless your workbench is designed with a horizontal apron or skirt and dog holes, it is difficult to support the end of a long board along its edge. 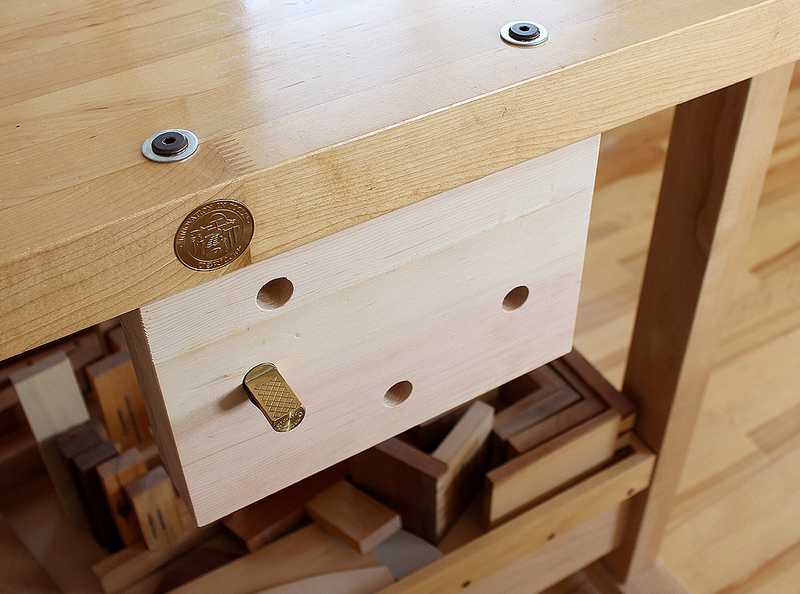 When not in use, the board jack is quickly and easily removed and stored beneath a workbench. 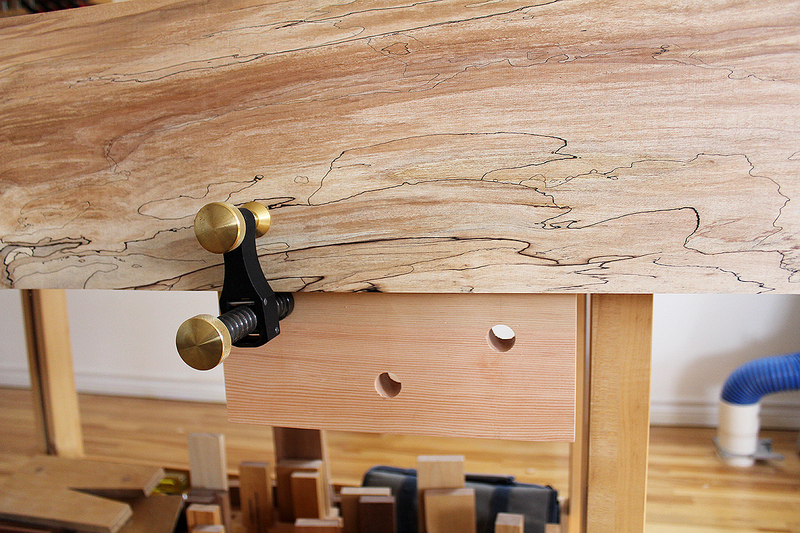 An alternative is to incorporate a sliding board jack beneath the edge of a workbench top. Although this is an option, it is necessary to design the workbench with this complex feature. The portable board jack is instead designed to attach to the underside of a slab type workbench without any modifications to the workbench. All that is necessary are at least two dog holes close to the front edge of the workbench. You will also be able to easily clamp long, wide panels along the front edge of a workbench using the portable board jack. The portable board jack is designed to be versatile. It can be placed anywhere along a workbench top where dog holes are accessible. The portable board jack is attached to the workbench top using standard bolts. Quick-connect bolts allow the board jack to be quickly removed or installed, as well as attached to another area of the workbench. Several bench holding accessories can be used with the board jack including bench dogs and surface clamps. Comprehensive information, board jack techniques, large photos and (16) detailed computer designed diagrams (CAD) included with the board jack plan purchase. Images and illustrations of attaching the portable board jack to a workbench are also included.